Heat 1 tablespoon of the oil in a large heavy-based shallow saucepan over medium heat. Add the onion, salt and pepper, and cook, stirring, for 4–5 minutes or until soft. Add the risoni, water and stock and bring to the boil. Cook, stirring, for 6–8 minutes or until the risoni is soft and the liquid has reduced. Stir through the crème fraîche and parmesan. While the risoni is cooking, heat 1 tablespoon of the remaining oil in a large non-stick frying pan. Add the cauliflower, salt and pepper, and cook for 5–6 minutes or until golden brown. Place the mint, pistachio and remaining oil in a small food processor and process until finely chopped. 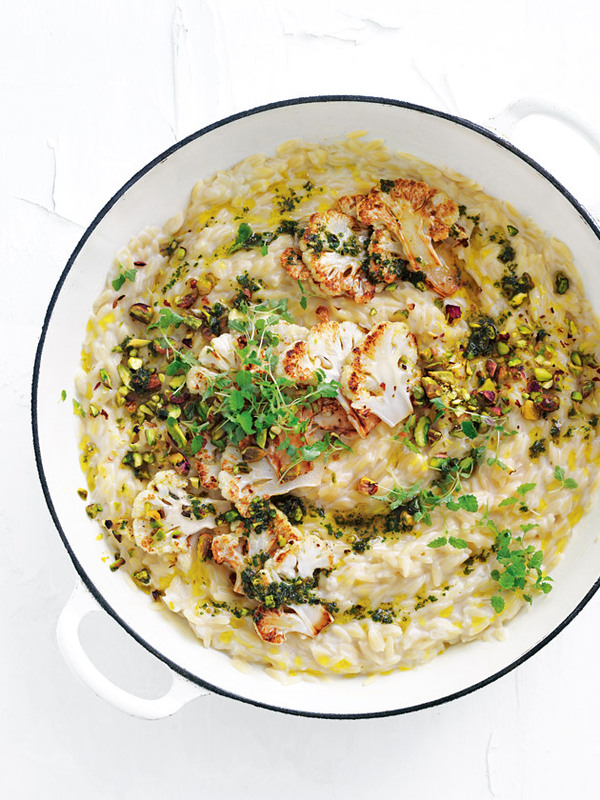 Top the risotto with the cauliflower, mint and pistachio oil, and serve with lemon balm and extra pistachio. Serves 4.